The ingredients for the non-pandan version is pretty much the same as with the greenish seri muka, all except for the omission of the 100ml of pandan juice. This is easily made up for by substituting it with a more or less equal amount of egg and santan concoction, i.e. one more egg and 50 ml more santan. The results are pretty satisfactory, less for the custard layer being slightly harder than what I would have liked it to be. I also took the opportunity to test out a suggestion which I’d proposed in the kueh sarlat recipe but never gotten round to try, i.e. to increase the amount of flour added from 25g to 40g for a firmer custard layer which would be easier to cut. Truth be told, I think I would very much prefer the less flour version which yielded an uber creamy and almost creme brulee-like texture for the custard… So if I were to make this non-pandan version again, I would definitely revert back to the original recipe with just 25g of flour added as a thickening agent. It should work beautifully as it had always been. The holy trinity for this kueh, pulot (glutinous rice), santan (coconut milk) and telor (eggs). 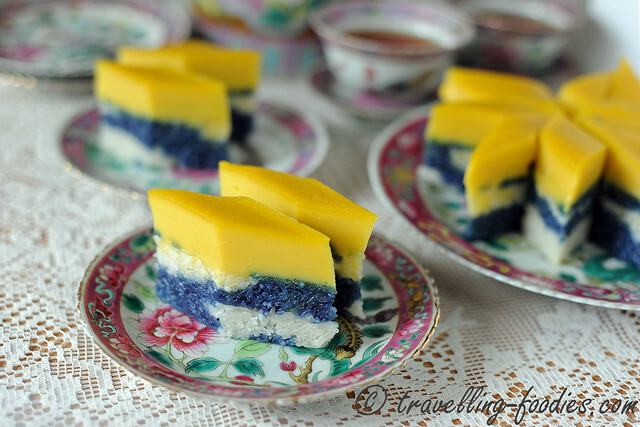 Following the tradition of the southern Peranakans in Singapore and Malacca, part of the glutinous rice is stained blue with the concentrated juice of bunga telang aka butterfly pea flower. I’d managed to get a pot bearing double-petal flowers at the recent SGF 2014 and it has been quite productive in churning out blossoms as long as it gets enough sunlight. So my flower picking days have ended… I think! As usual, it is good to use freshly squeezed coconut milk whenever possible but given limitations and circumstances, I reckon those packaged fresh coconut milk from our local supermarkets, or even those in pseudo-UHT tetrapak packaging or canned coconut milk from Thailand are acceptable. But if you have used fresh coconut milk to make kueh sarlat or for that matter, any dessert before, you know that there is no turning back. 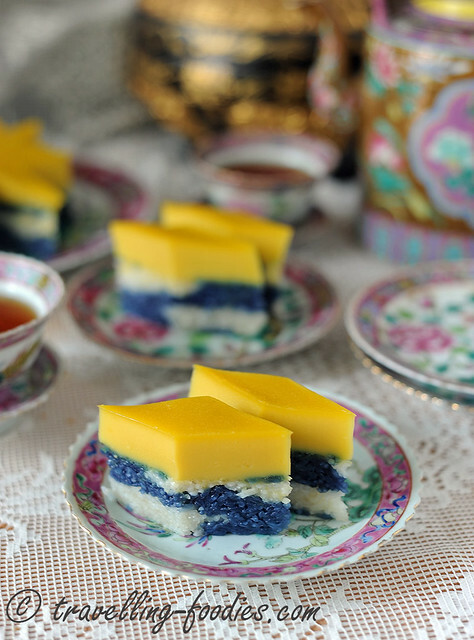 The custard layer needs to be heated until it thickens slightly before pouring over the cooked and compressed glutinous rice. It is essentially the same process as making kaya traditionally by the “kacoh method”. We call this the “kacoh method” because one has to stand by the stove with a medium-low flame and stir the concoction over a bain marie (water bath) ever so frequently to prevent the eggs from curdling and the coconut milk from splitting. This is in comparison to another form of serikaya which is made via the “kukos method”, where the concoction is steamed over very low heat until it sets to form a custard which has just set sufficiently to give it proper form. Although pandan juice is not added in this version of pulot serikaya, crushed and shredded pandan leaves are added nonetheless for them to impart their lovely aroma. To create that wondrous shade of yellow which the serikaya is much coveted for, the choice of eggs is important. Whenever possible, it is always good to get eggs containing yolks with a rich and deep jaune hue. These can manifest in the form of eggs from corn-fed chicken, or free range chicken aka kampong ayam etc. 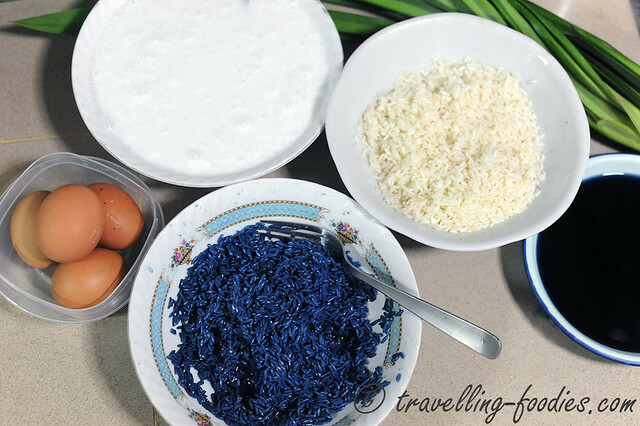 Otherwise, the process for making gading galoh aka pulot serikaya is very much the same as kueh sarlat, if not simpler! (4) Leave both bowls of soaked glutinous rice to sit for at least 4 hours or overnight in the fridge. 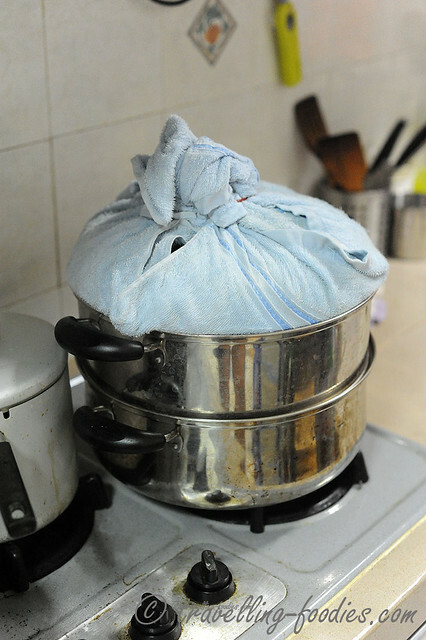 (5) Drain the soaked glutinous rice and spread out onto two separate plates for steaming. Crush or shred the pandan leaves slightly and stuff them between the rice grains. (6) Add salt to thinned coconut milk and give it a good stir to dissolve. (9) While waiting for the pulot to steam, begin with the preparation of the “serikaya” custard layer. (10) In a mixing bowl, add eggs and sugar. Whisk slightly to break the eggs and dissolve the sugar. Proceed to add coconut milk, plain flour and corn flour. Stir well until smooth and free from lumps. Set aside. 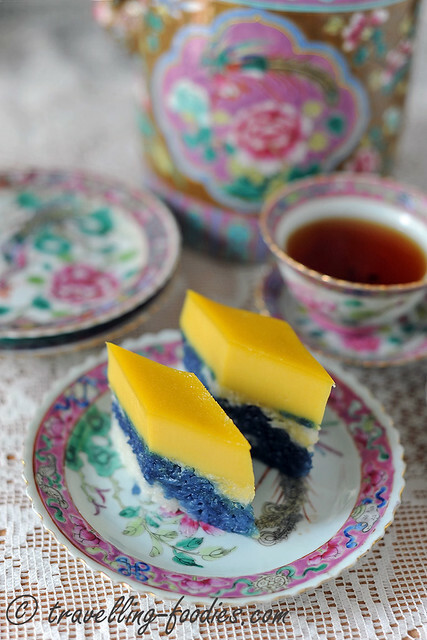 (11) When the pulot is done steaming, combine the two parts into a slightly greased 6″ square tin and press down with a “penekan kek” (kek lapis legit press) or the back of a sturdy metal spoon. Ensure that the rice layer is very very compact, especially around the edges and corners. Place the tin into the steamer and top up the water in it if necessary. Turn on the heat to get the steaming started over medium-low flame. (12) Return to work on the custard layer, strain the mixture in (10) into a heat-proof or metal bowl and sit this bowl over a pan of gently simmering water. 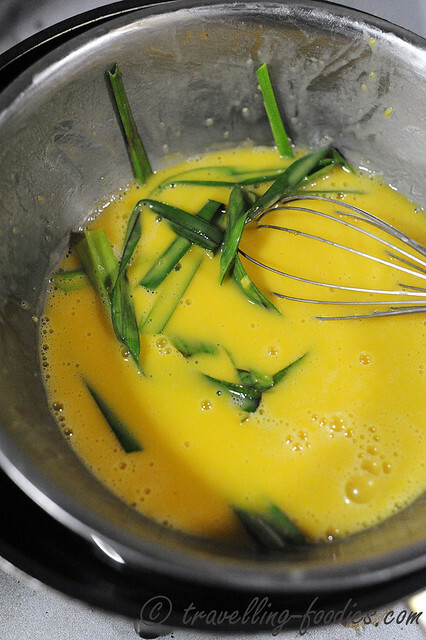 Add the crushed and shredded pandan leaves and stir continuously until custard just begins to thicken. Note that the custard batter should still be fluid and not viscous. (13) Pour the slightly thickened custard mixture carefully over the rice layer in the square tin. Strain if necessary to remove any residual flour lumps or curdled eggs. Steam very very gently over barely simmering water until the custard layer sets. It should take appro. 25-30 min. Wrap the lid with a large towel to catch any condensation. This entry was posted on December 3, 2014 by Alan (travellingfoodies). 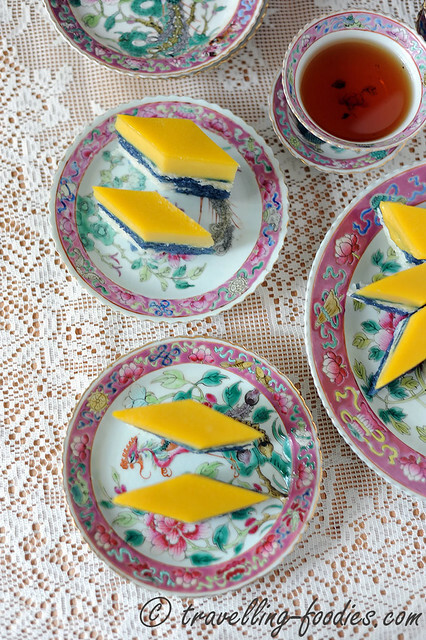 It was filed under Food, Simple Eats and was tagged with baba nyonya, bunga telang, coconut milk, custard, eggs, gading galoh, glutinous rice, kaya, Kueh Sarlat, Nonya, pandan leaves, Peranakan, pulot serikaya, santan, Seri Muka, straits chinese.